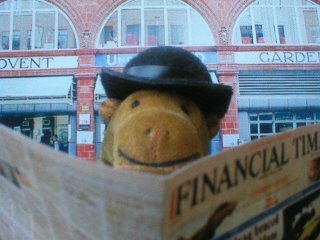 Mr Monkey wears his bowler hat whenever he works in London, getting the latest news from the FT. His umbrella is used to halt the mighty roar of London traffic by hailing a taxi, or to express Mr Monkey's rage when a taxi refuses to be hailed. 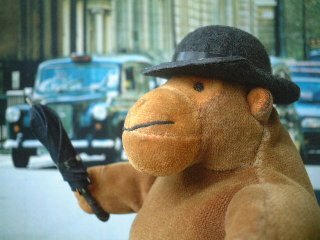 Mr Monkey's bowler hat is made from black felt steamed over the slightly modified end of a Kinder Surprise egg, with a black felt brim and a sticky back plastic hat band. His umbrella was made from an empty biro barrel, with wire spokes and fabric at one end, and a handle made from a pipe cleaner wrapped in a strip of card. Oh, and a little bit of a cocktail stick for the pointy bit.